I love my Converse. 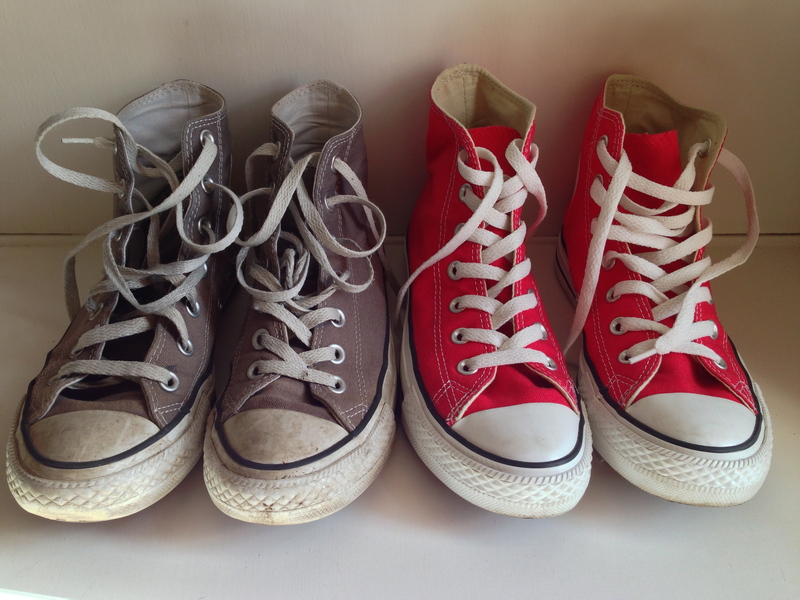 Apart from the occasional foray into my ‘grown-up’ shoes and summer sandals, I’m generally to be found in a pair of worn out All Stars. So, my birthday gift this year – a pair of bright red high tops – was perfect. I love them. And so does my daughter. She’s already decided that she needs a pair too, in pink and that my son needs a pair too, in blue. Though if he gets his own way, he’ll be in pink too, which is fair enough. But her love for them has made me worry a little. Am I too old for Converse? I’m thirty seven now. Will I still be wearing them when I’m forty? Fifty, even? Longer? And is that a problem? Perhaps the day I become too old for Converse is the day my kids go from wanting to emulate my footwear to being embarrassed by it. I know that every parent reaches the day when they stop being Practically Perfect in Every Way (thanks Ms Poppins) to being Embarrassing Parent. I’m ready for that day. In fact, I’m going to embrace all aspects of being Embarrassing Mum when that day arrives. Might dye my hair blue. Or take up the robot dance. I know that the physiotherapist chap I went to see about my poor knackered old feet wasn’t too thrilled when I told him that I mainly wear Converse, though he did say ‘at least they’re not ballet flats’ which apparently, along with the dreaded Ugg boots, are worse in terms of support. So maybe the day I hang up my Converse is the day my feet are well and truly too rubbish to cope with the lack of support and I’ll move straight from my high-tops into the velcro-fastening things my beloved Grandma wears. But then she’s 90, so I reckon if I can still bend over to tie my laces by then, I’ll be happy enough. What do you think? Is there an age limit for wearing sneakers? Let me know in the comments! Totally with you on this one – I’ve got a year on you, and still wearing the Converse (along with a collection of supermarket cheapy Converse “style” pumps). I even have some grey ones which I think of as my office ones, as they look good with a suit. The whole age appropriate dressing minefield is an interesting thing – my mum is in her 50s and still wears pieces that people stop her in the street to ask her about. I’m pretty sure that old people today have simply settled on a style and era in which they were happiest and most comfortable – so why shouldn’t we be wearing Converse, jeans and hoodies in our dotage? I look forward to it (although I may have to sneak some arch-support in there – but no one need know about that :)).